We manufacture and sell devices for prosthetists for 21 years. Most of them are of our production which guarantees the lowest prices, exemplary quality and most importantly full warranty and post-warranty service. Most of the products we offer are our production. We guarantee really the lowest prices. We have been producing for 21 years and we intend to produce debt. So you have a SECURE and QUICK SERVICE. Importers of products from the Far East are obliged to provide service only for the duration of the warranty. After the warranty, the device can often not be repaired. We have already equipped more than a thousand labs in our furnishing. Including many schools (Zielona Góra, Białystok, Zgierz, Łódź, Warsaw, Zabrze, Toruń, Lublin and others). 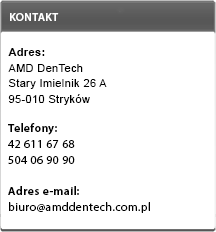 We have satisfied customers not only in Poland, but also in Europe and the USA. Our dental technician service policy provides for the specificity of the profession. We can always send a replacement device for the time of repair. Our company manufactures, invents equipment and sometimes also imports so that products are not only of the highest quality, but also affordable. Thanks to our contacts, we are able to present an offer for all prosthetic equipment and devices. It is worth to send a question to us if you have planned purchases.